"Provide a high quality, inexpensive transceiver that encourages special groups of hams to communicate with minimal effort." 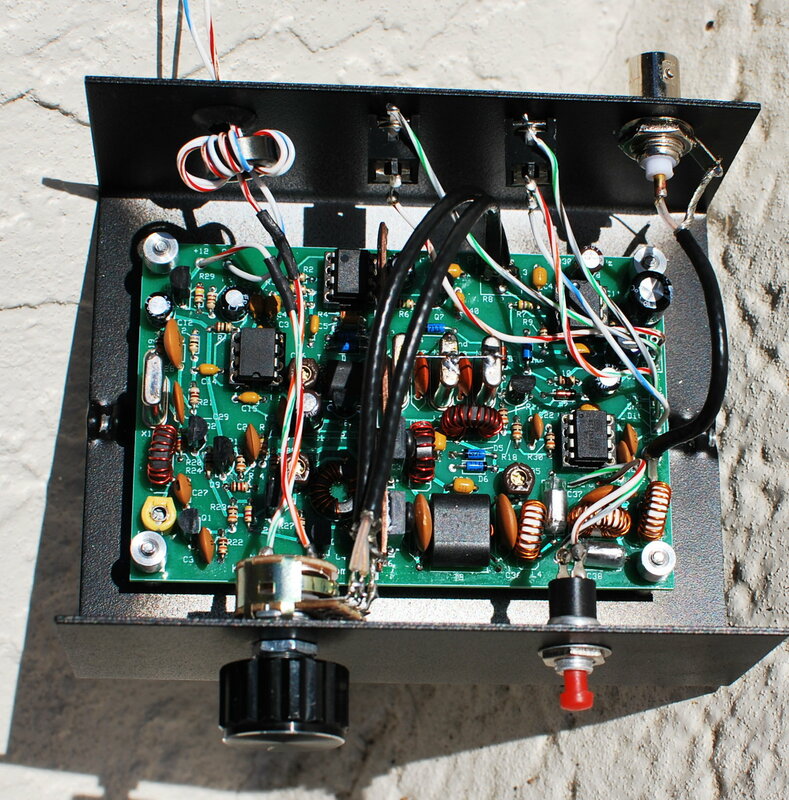 This transceiver was designed for Radio Clubs and/or Special Events. You turn the radio on...you listen...you do not tune...you do not switch anything...you do not search. If you hear someone on "your special frequency", there is a good chance it could be a member of your group. and it is as sensitive as just about anything else that you may have in your radio shack. You can customize pigrig frequencies for your club/group; 40 and 80 meters only. The name of this radio shall henceforth be labeled "The Flying Pig Rig". If you are missing any parts, contact me immediately. I and will ship the parts the same day. 2 phone jacks, a bnc jack, a push-button, volume/on-off switch, magnet wire, heat sink mounting screws and nuts. This kit uses four (4) all black ferrite toroids. One (1) FT37-43 and three (3) FT37-61 toroids; they look the same. The FT37-43 is included in the bag with the 1/8 watt resistors and crystals. 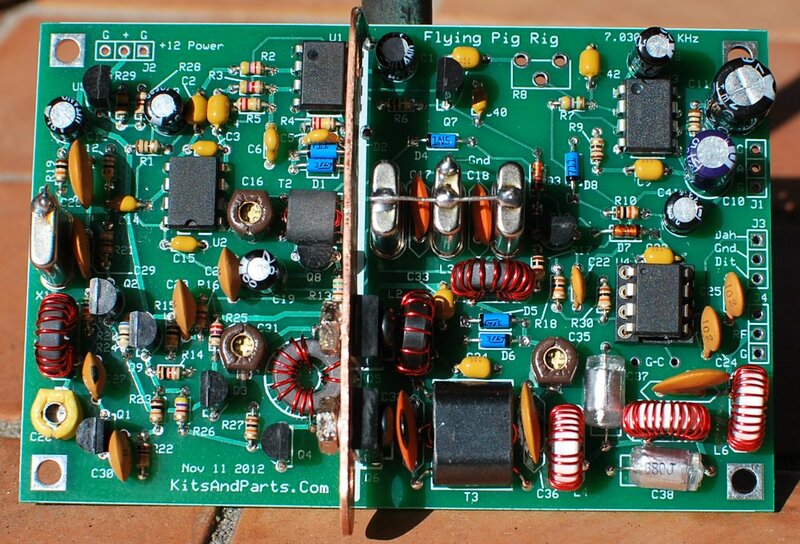 The Serial Number may later be used for tracking in PigRig QSO contests. This document has specific instructions for both 40 and 80 meters. I made one out of a 1/4 inch metal rod and filed a small slot into the rod to hold the 1206 size caps. 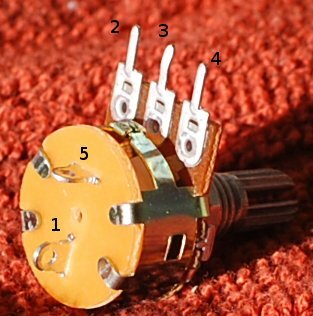 There are 13 pieces 100n capacitors on the PCB; 2 caps, C33 & C34 must use the SMT caps for proper decoupling. The remaining 100n caps may use the SMT caps or the 100n disks. Recommend you install the SMT caps. If you do not install the SMT caps, then the disks can be installed later. Be careful not to mix up the one 1K and the 10K resistors. The volume control R8 is installed last. Save 3 cut resistor leads for use later to ground the crystal cases. DO NOT INSTALL R31 AT THIS TIME. It may or may not be installed to adjust sidetone volume later. R8, the 10K pot/switch will be installed later. The next 4 resistor values depend upon the band of operation. Remove the FT37-43 toroid from the packet that contains the crystals. 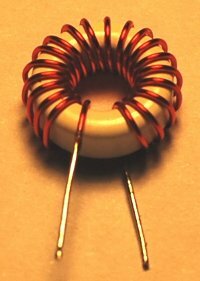 ____L2: Wind 11 turns of 26 GA red magnet wire on an FT37-43 ferrite toroid, evenly spaced. Cut 12 inches of 26 GA wire. Wind the wire on the toroid clockwise. Trim the wires of L2 to a half inch each. This part will be installed later. 5. Install transformer T2 (small binocular in small plastic back including 34 ga wire). T2 xfmr is a BN-61-2402 binocular core threaded with fine 34 GA magnet wire. ____Cut 10 inches (25 cm) of 34 GA red magnet wire and fold the wire in half. Tin the twisted part of the wire using solder and hot solder pencil. applying heat and solder for about 10-15 seconds. Move the solder pencil back and forth to generate a little friction on the wire. Insert the wire ends thru the binocular holes. Insert each wire end thru the opposite hole. We now have two (2) full turns with a center tap. Repeat 6 more times for a total of 8 full turns. A full turn is defined as a wire going thru both holes of the binocular. Trim the wire ends to about 1/2 inch and tin with solder. ____Cut 4 inches (10 cm) of 34 GA red magnet wire and fold the wire in half. This creates two full turns. Cut to 1/2 inch each and tin. This is what T2 should look like. Insert T2 into the top of PCB and solder on the bottom, trimming excess leads. ____Cut 9 inches (23 cm) of red 26 GA magnet wire and tightly wind 10 or 11 turns on the toroid. 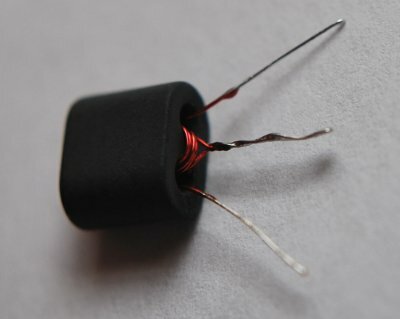 ____Cut 4 inches (10 cm) of red 26 GA magnet wire and fold the wire in half. Using solder and a solder pencil, tin 1/2 inch of each wire, about 1/2 inch away from the twist junction. 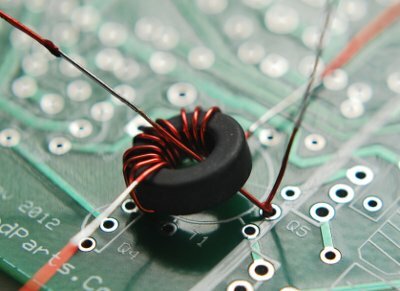 Install the wire by inserting the twisted end into the PCB as shown. Solder and trim. Insert one of the free wire ends thru the toroid as shown. Insert the 10/11 turn wires into their installation holes, leaving about 1 inch slack above the PCB. Bring the wire that is protruding thru the top of the pcb over and around the toroid and insert the end into the hole above the center tap hole. Bring the other open wire over and down thru the toroid and insert into the hole below the center tap hole. Slowly, tighten the wires and pull the toroid down to the PCB, by alternating pulls on the 4 unsoldered wires. 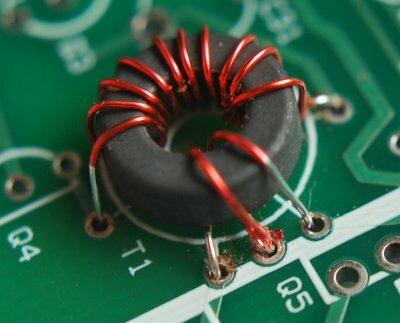 When the toroid is mounted flush on the PCB, solder and clip leads. Make sure that ALL the leads going thru the holes are tinned and ready for soldering. 4 turns primary centertapped and 4 turns secondary for 80 meters. T3 is made just like T2 except for wire length and turns. Cut 5"(40m) or 9"(80m) of 26 GA wire and create a 2(40m) or 4(80m) turns primary centertapped. Cut 4"(40m) or 8"(80m) of 26 GA wire and create a 2(40m) or 4(80m) turns secondary. Install into the PCB, tighten all wires, solder and trim leads. 8. Install all ICs and one IC socket. 10. Install all Crystals and 2 capacitors. ____C17,18: 470p (471J) tan disk caps; install between the crystals. 11. Install all remaining capacitors. Do not install C32. It will be installed later. 13. Wind and install all remaining Toroid Inductors except L2. L1 & L3 for 80 meters will use 27 ga green wire, not the larger 26 ga.
____L1: For 40 meters, wind 17 turns of 26 GA red magnet wire on an FT37-61 ferrite toroid, evenly spaced. ____L1: For 80 meters, wind 24 turns of 27 GA green magnet wire on an FT37-61 ferrite toroid, evenly spaced. For 40 meters, cut 11" of 26 GA wire. Wind the wire on the toroid clockwise. For 80 meters, cut 15" of 27 green GA wire. Wind the wire on the toroid clockwise. Trim the wires of L1 to a half inch each. 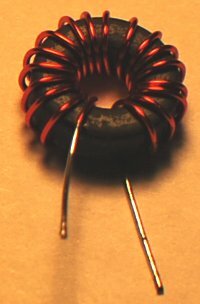 ____L3: For 40 meters, wind 18 turns of 26 GA red magnet wire on an FT37-61 ferrite toroid, evenly spaced. 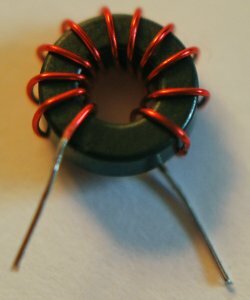 ____L3: For 80 meters, wind 27 turns of 27 GA green magnet wire on an FT37-61 ferrite toroid, evenly spaced. ____L4,6: For 40 meters, wind 20 turns of 26 GA red magnet wire on an T37-7 white toroid, evenly spaced. ____L4,6: For 80 meters, wind 20 turns of 26 GA red magnet wire on an T44-2 red toroid, evenly spaced. Cut 12" (40m) or 15" (80m) of 26 GA wire. Wind the wire on the toroid clockwise. Trim the wires of L4,6 to a half inch each. ____L5: For 40 Meters, wind 23 turns of 26 GA red magnet wire on an T37-7 white toroid, evenly spaced. ____L5: For 80 Meters, wind 22 turns of 26 GA red magnet wire on an T44-2 red toroid, evenly spaced. Cut 13" (40m) or 16" (80m) of 26 GA wire. Wind the wire on the toroid clockwise. 14. Prepare the Copper Heat Sink & Install the RF Final Transistors. This Kit uses a custom pure copper heat sink that will require preparation. a vise, and a flat head hammer. Hammer it until it is totally flat; may take a few minutes, but Copper is soft. With a pen, mark 2 drill holes exactly 0.5 inch and 1.0 from one end, centered from top/bottom. If you have a punch, punch the copper at the marks for easier drilling accuracy. Drill 2 holes using an 1/8 inch drill bit to accommodate a size 4-40 screw. Deburr the holes using a larger drill bit or other hard tool. If you wish, cut of the excess copper per the picture; file/sand/deburr. Make shure that the part number (BD139-16) is visible, facing to the right, away from the heat sink. Apply a little heat sink grease between the heat sink and the finals. Fully insert the assembly into the Q5 and Q6 labeled locations. or enough so that the heat sink does not short to pins 5-8 on U1. all the time keeping the heat sink parallel to the PCB. ____L2: Locate the previously prepared toroid with the 11 turns red magnet wire. ____C32: For 40 meters only, 270p (271J) NPO dark tan disk cap; install between the finals and T3. The TP/TPB/TPC-19 ($7.81) and TP/TPB/TPC-41 ($9.15) are ideal for this project. Connect the Push Button Switch via 2 wires to the PCB holes below pins 4 and 5 of U4, labeled "G-C"
Connect +13V volts (+/- 1 volt) to the holes in the upper left corner of the PCB. If you live near AM broadcast stations, you should install a common mode choke in the 12V power wires. Make a choke using the FT50-75, half inch diameter black toroid with 5 turns of dual 26 gauge wires. The power supply ground must connect to the PCB/chassis through the choke only. A 1/4 inch Rubber Grommet is included to protect power wires running through a chassis/enclosure wall. Connect a 5 watt or greater 50 ohm dummy load to the antenna connector. Connect a frequency counter to the RF ouput. Apply 10 (ten) Volts DC power...this prevents damage to the finals in case there is an error with the binocular ferrite. Most Freq Ctrs are sensitive enought to measure the RF ouput by connecting the FC probe onto anything metallic on/near the dummy load. if this is not the case, connect the FC directly to the RF output, or through a small coupling capacitor, less than 10 pF. If you do not have a frequency counter, use a calibrated accurate receiver, setting the receive freq to the center frequency listed above. This completes the transmitter output frequency alignment. The oscillator switches between receive and transmit modes by including the 18pF or 47pF capacitor C27 in parallel with C26 when in transmit mode. When C27 is not grounded through transistor Q1, the X1 oscillator frequency is about 600 Hz higher, which provides the receive mode offset frequency. When a received signal is directly in the middle of the bandpass, you will hear the signal as 600 Hz +/- from the speaker/headphones. Apply 13.6 Volts DC and Adjust C31 for maximum transmitter output. You can use a wattmeter or SWR meter or receiver to adjust C31 for maximum output. This completes the transmitter driver alignment. 18. 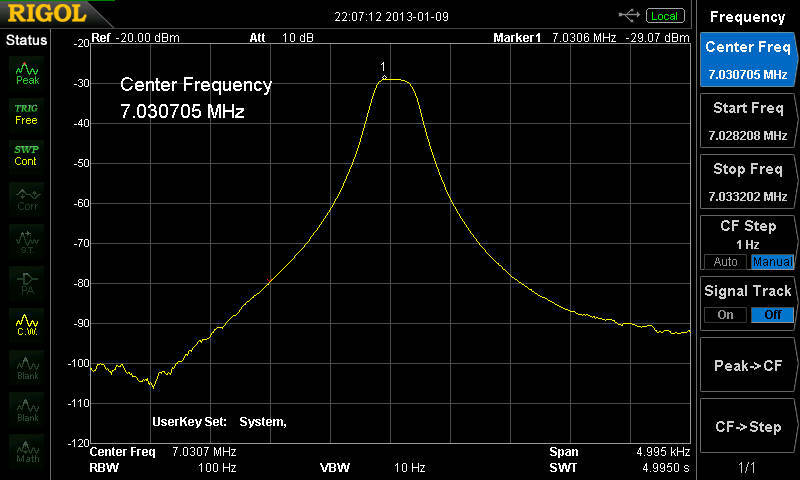 Receiver Alignment using a CENTER FREQUENCY signal source. Connect any antenna to the Pig Rig. Anything from a 2 foot wire up a large antenna. Turn on a signal source in the shack. Either a low power transmitter into a dummy load or a sig-gen. Adjust C16 and C35, back and forth for maximum audio (approx 600 Hz) coming from the speaker/headphones. It is important to note that the signal source is on the exact CENTER FREQUENCY to optimize the bandpass filter for a narrow bandwidth. This completes the receiver alignment. The sidetone volume is fixed/set by the resistor R31. 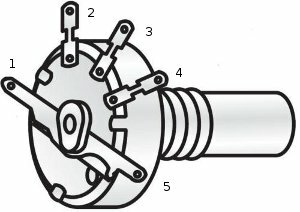 Loudest sidetone volume is with R31 not installed. This completes the sidetone volume adjustment. "E" (.) or "T" (-) Toggles between normal keyer and straight key mode, acknowleged by annunciating "S" (for Straight Key Mode) in CW. The keyer mode is NOT saved on power-down. "R" (.-.) Toggles between normal and reverse paddles keys, acknowleged by annunciating "P" (for normal paddles) or "X" (for reversed paddles) in CW. The paddles (normal or reverse) are saved on power-down. To Reset the Keyer to the Default mode, hold the Cmd button active until you hear "OO"
The PigRig is now finished, ... except for your first QSO. See you on the PigRig Frequencies. 2013 Jun 18 - Updated schematic to correct L2 windings from 12 to 11 turns. 2013 Jun 18 - Pictures of a built 80 meter version will be available by June 22. 2013 Sep 24 - Added the word "green" to section 13 for L1 & L3, 80 meter toroids. Bandwidth scan of the 3-crystal front end filter.